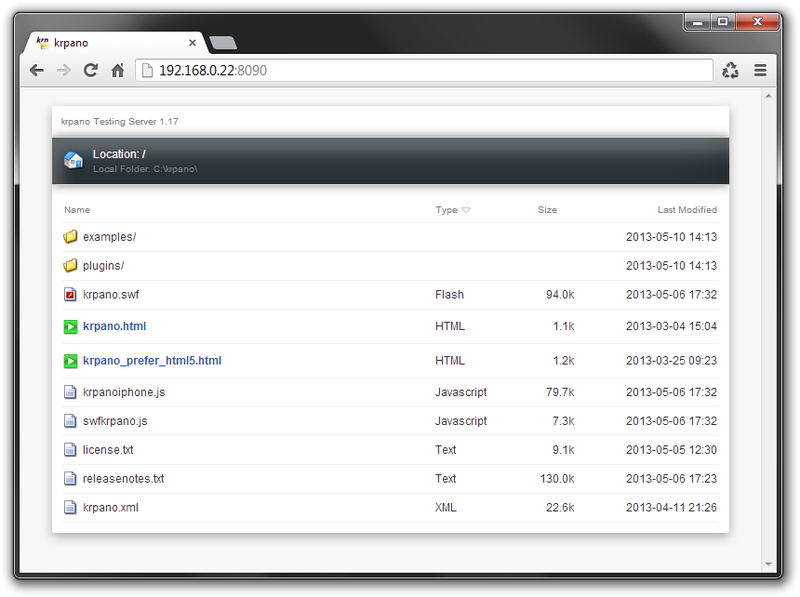 The krpano Testing Server is a small, simple and easy-to-use static-file localhost server. It makes it possible to test krpano Flash and HTML5 outputs locally without any local-file restrictions and without uploading. Other computers and devices in the local network will be able to view the files. Additionally it's possible to control the browser caching and to limit the download-speed to simulate and test slower Internet-connections. The tool is included in the normal download packages. Start the krpano Testing Server. or simply move the folder (or a html file) directly via drag and drop on the tool. The server will start now and the server address will be shown as hyper-link. When a html file was dropped on the tool, then the browser should directly open it now. To view the local folder press the hyper-link or enter the server address in the browser.